Congratulations on deciding to get your own boat! Before you decide on boat size or cost, the most important thing you can do is be sure to buy the right boat type for you and your needs. Once you’ve identified the activities you’re interested in you can create a short list of boat types and then look at manufacturers from there. With your short list of manufacturers of the boat type that’s right for you, then you can go shopping to find that boat in your price range (whether that is new or pre-owned). Use the Boat Selector Tool on Discover Boating Canada to get an idea of the boat types that you should include on your shortlist. Then have a look at the manufacturers of that boat type using the links on the boat types page. To make sure you get the right boat size for the lakes you’ll be boating on talk to a local dealer and discuss where you’ll be boating as well as the kinds of activities you want to do. When considering a boat purchase, there are two things to look for. First, look for a boat that is NMMA Certified. NMMA Certified boats are built to American Boat and Yacht Council (ABYC) standards which go even further than Transport Canada standards. The good news is that over 80% of the boating industry builds to these standards. So by getting a boat that is NMMA certified, you know you are getting a boat that is built to the highest standards. Here is a link to NMMA Certified manufacturers: http://www.discoverboating.ca/buying/certified/boats.aspx . The second thing to consider is a manufacturer’s Customer Service Index (CSI). CSI awards are presented to any manufacturer who received a 90% or better ranking on average from people that own that boat. And who better to tell you about a boat than an owner? If you are planning to buy a used boat, a marine survey it is not mandatory, but very definitely recommended. If you are buying a pre-owned boat whether its online, in the newspaper, or by visiting local boat dealerships - once you find your boat, but before you buy – be sure to get a marine survey of the boat. There is no question that the expense (approximately $17 - $20 per linear foot) will be money well spent. Often, structural defects or mechanical problems on boats that are old or have not been cared for properly, may be difficult to detect. A marine survey is sort of like a home inspection. The surveyor will thoroughly inspect every part of the boat - from the engine to the electrical system, the hull to the dash - and give you an analysis of the results. Depending on the results, you can benefit from this information with power to re-negotiate the buying price of the boat, knowledge to step away from the deal altogether if needed, or the peace of mind knowing that nothing will need repair in the foreseeable future. You can find a good marine surveyor in Canada by visiting MarineSurvey.org and use the menu on the left-side of the webpage to find a marine surveyor near to your location. It’s very easy to transfer ownership of a boat. Just use this link to submit your application to Transport Canada within 90 days of purchase. Also, take a look at this link from DiscoverBoating.ca for more details and helpful information about purchasing a boat. Also, a note on boat financing - terms are typically longer than those that are arranged for say, a car, and quite often range from 12 to 20 years. Of course these all depend upon the amount being financed, the interest rate and, as you mentioned, the amount you wish to spend each month. 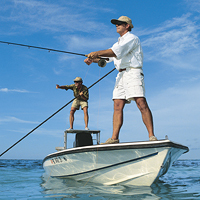 Have a look at this page for information that you might find helpful regarding boat loans. There’s also a boat loan calculator that you might find useful. Remember to include costs like insurance, fuel, maintenance and storage which typically amount to about 10% of the cost of boat ownership in your considerations. There are several marine focused lenders out there that you can work with, and your dealer should also be able to help you navigate the process. They have good relationships with their lenders and will be able to help you in securing a good rate and terms that suits your needs. Good luck and safe boating.